When I was young, I used to wonder why people would worship false gods. But at this stage in my life, it's easy to see why, especially now that I've attended a couple of Chinese pro basketball games with the Shanghai Sharks. Their star is Jimmer Fredette, whose Chinese nickname of "Fo Shen" or "Buddha God" suggests that he is the god of basketball. He seems to be worshiped, not just by the Chinese, but especially by his pagan fans from the West who wear their BYU T-shirts and go wild whenever he scores. Icons of Jimmer are even more plentiful now that he has been named MVP among the international players of the Chinese Basketball Association. They prominently feature the character for "god" as you can see below in a WeChat screen shot from last night. The largest character is one meaning "god." Kudos to Jimmer and his team. He is such a good representative of basketball, of BYU, and of the Church with his humble, kindly demeanor in the midst of fame. I was in an informal meeting where a couple of business leaders and a party official got to meet Jimmer, at their request, once they learned that he attends church services with us at the beautiful Shanghai facility we rent. When Jimmer came in, he wowed them with his humility, his kindness and the signed, framed photos he brought. The Chinese men were almost giddy with excitement, and one of them rapidly cited Jimmer's statistics here and in the States and was genuinely enthusiastic about his skills. It was great fun! The great thing about Chinese basketball is that you actually don't have to lose your eternal soul to be a wild fan of Jimmer. Here's hoping that he's here again next season! Speaking of false gods, I just noticed an outstanding update on the debate and scholarship around Psalm 82 and it's statement on gods that Christ also quoted. See Ben McGuire, "Reconsidering Psalms 82:6" at FAIRMormon.org. On something of a whim, my wife and I met up with an Australian map dealer while he was in Shanghai last Saturday and bought our first antique map. It was made in 1715 by Nicolaes Witsen, a cartographer, Dutch statesman, and mayor of Amsterdam 13 times. It shows Asia and the Near East, including Arabia (images below). Like other maps he had that showed Arabia, this was not one of the rare maps that show a Nahom-related name (Nehem, Nehhm, or Nikkum), but it does provide good detail and many other place names. I feel it is beautiful and tells a variety of stories. I spent over an hour talking with Vince U., an experienced map collector, who told me a lot about old maps. The color on these old maps was typically provided by hand with watercolor after the printing was done using an engraved copper plate. You can see the indentation in the paper where the plate was pressed. You can also see the wiremarks from old papermaking technology as something of a watermark in the paper. The maps were typically prepared in large and very expensive atlases that were usually owned by the elite and wealthy in Europe (dukes, barons, etc.). Europe is where they were produced and that was where the real market for them was. My map, like many other old maps from that era, is in very good shape because it probably sat in a protected atlas on a shelf until somebody decided to get some money from the antiquity, at which point the binding of the atlas was removed and the individual maps were extracted and sold. The map I purchased offers a variety of lessons from history. One is how little geographical data or other information related to practical travel can be gleaned from Arabia on this and many other old maps. Where is the Empty Quarter? Where is actual water versus the numerous dry wadis on the map? Where are impassable regions and where can one actually travel and survive? One further question which maps can't answer is also relevant to Nahom in the Book of Mormon: Which place names are relatively modern and which were around in, say, 600 BC? Another lesson is how scientific error can be preserved and propagated through the weight of poor authority. My map features a large lake northeast of India that serves as the source of several major rivers. This lake does not exist. Another mapmaker long ago, working with an absence of information about that region, figured there had to be some major source for the large rivers of India which begin in the Himalayas and elsewhere. One mapmaker made a guess and stuck a huge mythical lake on the map, and it persisted for many years on other maps, relying on the authority of those who had gone before. As I recall, that mythical lake persisted for over a century, maybe closer to two centuries, on high-end, carefully researched maps. Again, these beautiful old maps were usually owned by very wealthy people, mostly in Europe, but some made it to the states, and some libraries obtained atlases or individual maps or books with foldout maps. They are not the kind of thing that local frontiersman would view and handle while relaxing at a tavern. They are not the kind of thing that farm boys with little education would go examine after a day of plowing, though one could certainly imagine a kindly local timber baron coming through town and stopping young Joseph Smith with a greeting like, "Hey, my young farmer friend, put down that shovel and come look at this rare map from Europe. Cool, eh? Hey, clean your hands before you touch it." This scenario solves the problem of Joseph the young bookworm having to go about 200 miles away, as far as we know, to get to the nearest library having a Nahom-related map in its archives. The kindly timber-baron scenario also solves the problem of Joseph obviously not being a bookworm, with no evidence that he ever availed himself of libraries or bookstores before the Book of Mormon came out. A wealthy map owner shoving his rare map in front of Joseph's face is a more plausible scenario than Joseph seeking one out in a distant library. But to be more plausible, we need our timber baron to help Joseph notice something that almost nobody would notice otherwise: "Joe, quit looking at all those big cities and remember this little gem near Sanaa: Nehem. Can you spell it? Nehem. Nobody's ever heard of it, but it's there, and it sure would add some nice local color if you ever want to write a tale about Arabia. It won't be helpful now, but maybe in the future when everybody knows all about Arabia. And make sure you finish with a happy ending. Nobody likes novels where all the good guys get wiped out in the end. Cheers!" Yes, this could have happened, theoretically. A delightful trend in modern Book of Mormon criticism today is to scour books, articles, and maps for information that hypothetically could have aided Joseph Smith in fabricating many of the interesting details of the Book of Mormon. Whether it's Nahom and Bountiful in the Arabian Peninsula and the many other Arabian evidences for the plausibility of Lehi's trail, the ancient practice of writing on metal plates, the many correspondences between the Book of Mormon setting and ancient Mesoamerica including the existence of ancient written records, temples, roadways, and buildings of cement, or textual issues like chiasmus and Hebraisms, there is a concerted effort, now aided with advanced computer searching across tens of thousands of documents, to find bits and pieces of numerous scattered "smoking guns" to create the case that the book is simply a product of Joseph's environment. I find this delightful and perhaps a little ironic because many of the apparent Book of Mormon strengths for which related modern sources are being sought began as Book of Mormon weaknesses. This is readily evident for language issues such as the silliness of Alma as a man's name, now verified as an ancient Jewish man's name, or the horrific blunder (now known to be a perfectly appropriate Hebraic expression) of Moroni waving the rent of his garment (repaired later to be the rent part of his garment). But many other early weaknesses are now strengths to be undermined. Recently we have discussed some of the interesting broad archeological issues noted by Dr. John E. Clark, which raised the issue of whether knowledge of ancient advanced civilizations in the America was actually common knowledge or not. Evidence that it was not common knowledge, in my opinion, is the great surprise caused by the 1841 publication of John L. Stephens, Incidents of Travel in Central America, Chiapas and Yucatan, 2 vols. (New York: Harper and Brothers, 1841). It was a surprise to many educated people but especially to the Mormons, who now had evidence at last to confront some of the arguments being levied against the Book of Mormon. In the discussion of the value and originality of Stephens' work, the critics often view the significance of his work for Mormons as merely establishing that there were ancient civilizations in the Americas -- something that a number of other people had written about without creating widespread interest and awareness among citizens of the United States. But in fact, Stephens' work did far more than that. Understanding the correspondences between Stephens' report and the claims of the Book of Mormon helps remind us that the evidence from the Americas pertaining to the Book of Mormon is much more than just "yes, there was an ancient civilization." It reminds us that if Joseph Smith was the source of the Book of Mormon, his luck or his success in research about the Americas went far beyond just being right about the existence of ancient civilization. First of all is the issue of geography. The Book of Mormon describes ancient civilizations with written records that were in a relatively small area (no, a hemispheric model advocated by some early Mormons simply does not fit the travel distances given in the text) with a narrow neck of land surrounded by oceans. Using the internal geographical references in the Book of Mormon, one can construct a highly self-consistent map (this alone is quite surprising if the book is Joseph's crude fabrication dictated from a hat). With that internal map, we can then ask the question: can this map possibly fit anywhere in the New World? Latter-day Saint scholars familiar with the geographical issues have a fairly broad consensus that Mesoamerica, right around the region explored by Stephens, is the only potentially plausible location for the internal map of the Book of Mormon to have any hope of overlaying real geography. It is a place with a narrow neck of land, oceans, at least one excellent candidate for the River Sidon that flows north for at least part of its run, a place where battles fought in winter are not fought waist-deep in snow but in a climate where warriors can still be weary in "the heat of the day," etc. What is amazing is that the only place where the geography might line up with reality is also the only place where ancient peoples kept written records. It is a place unlike Joseph's environment where ancient temples and roads were built. It is the only place where the geology also lines up, with active volcanoes and earthquake faults in the time frame required for the apparent volcanic and seismic activity we encounter in 3 Nephi. Those details aren't found in Stephens or other sources Joseph could have seen. Nor is one other important correspondence between Mesoamerica and the Book of Mormon: the rise and dating of two major civilizations or clusters of civilizations. Below is a figure from Dr. Clark's "Archaeological Trends and Book of Mormon Origins," BYU Studies, vol. 44, no. 4 (2005) which compares the cities of the Jaredites and the Nephites with the general time frame of the Olmecs and Mayans in Mesoamerica. He is not arguing that the Nephites or Lamanites were Mayan, but that the rise and fall of major civilizations in Mesoamerica (which included many sister groups) provides an environment and time frame which could accommodate the major groups of the Book of Mormon. The rise and fall of two civilizations is an important issue which I don't think Joseph could have snatched from sources in his day. In this, the Book of Mormon merits credit for a further correspondence with Mesoamerica, even to the point of implicit carryover from the first civilization to the second, as occurred in Mesoamerica and as is found in shared names between Jaredites and Nephites, especially Nephite dissenters or rebels. It appears that the total destruction Ether saw was the total destruction of two armies, while some Jaredites escaped and were around to influence later cultures after the Nephites moved in. The building of temples. Nephi says his temple was patterned after King Solomon's (2 Nephi 5:16). Stephens wrote that "The genii who attended on King Solomon seem to have been the artists." Palaces (e.g., compare the "specious palace" of King Noah to the Quiche or Palenque palace described by Stephens. The place of the judgement seat in the Book of Mormon, perhaps comparable to the tribunals of justice mentioned by Stephens. As previously noted, the idea that ancient Native Americans had written records was still hard to accept for many. Many viewed the glyphs as symbols related to astronomy rather than a versatile written language. It would take decades for the nature of ancient Mesoamerican writing to become widely known. Meanwhile, in spite of Stephens' immensely helpful publication, critics would continue to attack the Book of Mormon unnecessarily on issues such as the existence of ancient writing systems. Roper notes that one critic in 1839 wrote, "According to Mormon, these native Americans could read, and write, … but when that country first became known to Europeans, the inhabitants knew no more about letters than a four-legged animal knows the rules of logic; and not a scrap of writing was to be found." An 1840 critical publication claimed that there was not "even so much as a shadow or proof, that the sciences of reading and writing [and other evidences of advanced culture mentioned in the Book of Mormon] were ever known here." Some of the items listed above are mentioned in some much less well known sources that may not have been known to LDS people before Stephens created so much interest in this area. Some such as nakedness or the use of specific weapons and armor could happen in a variety of places, But the abundance of correspondences in Mesoamerica, not just from geography alone, makes the impact of Stephens' work much more interesting than merely showing/confirming that ancient civilizations once were here. There are many surprising details -- especially if you dig into the 800 or so correspondences compiled by John L. Sorenson in his remarkable Mormon's Codex, some of which are interesting examples of Book of Mormon weaknesses that are becoming interesting strengths, though yes, puzzles and problems remain. Just not as many as we faced in the 1830s. Some things that were laughable then are much less ridiculous today. The [Book of Mormon's] description of ancient peoples differs greatly from the notions of rude savages held by nineteenth-century Americans. The book's claim of city-societies was laughable at the time, but no one is laughing now. That's idiotic. In the 1820s, everyone and their uncle knew the basic stories of Pizarro and the "city-society" of the Incas, and Cortez and the "city-society" of the Aztecs; they knew about pyramids and other ruins around Mexico City---they knew that Montezuma ruled over a great city---they knew about the big burial mounds studded with strangely worked artifacts in the northeast U.S., etc. Everyone and his uncle knew this, we are told. But that's not evident in the reception such claims met in the early days of the Book of Mormon. The behavior of early Latter-day Saints and their critics strongly reinforces Dr. Clark's observation and reminds us of the dangers of hindsight in evaluating the Book of Mormon. Our critic goes on to explain that pyramids, writing, civilization, building with cement, and so forth in ancient America were widely promulgated in an extremely popular work, Bernal Diaz del Castillo's Conquest of New Spain. So those claims in the Book of Mormon would have been obvious and easy for Joseph to concoct. Likewise, other critics called my attention to the works of German scholar Alexander von Humboldt who described scenes of ancient civilization in Mesoamerica long before the Book of Mormon came out. Joseph surely was aware of the abundant information about ancient civilization in the America's, they say. Nothing impressive in writing about that. Yawn. So if everybody and their uncle knew about Bernal Diaz's Conquest of New Spain, I imagine we would find thousands of references to it in pre-1830 works. But a search on Google Books for pre-1830 works with the string "Conquest and New Spain" and either "Bernal" or "Diaz" yields only 5 or 6 works that appear to mention Diaz. A search for "Bernal Diaz" and "Conquest of Mexico" yields 8 works, including his own. Many more make mention of Bernal Diaz, of course. And yes, many publications had mentioned Cortez and Montezuma. But the issue is not so much what was on paper tucked in a library or university somewhere, but what was in the minds of Americans in 1830. In those early days, Diaz, von Humboldt, and Ethan Smith (who mentions and misquotes von Humboldt) were not cited as evidence for the obviousness or even plagiarism of the Book of Mormon, just as they were not cited by critics of the Book of Mormon. This all was a much later innovation of our critics. If early Latter-day Saint leaders were con-men and knew of the works of von Humbold, Diaz, etc., then why not call attention to the corroborating evidence in these works? Why not arrange for a third-party to come back from a remote library with a new treasure of Book of Mormon evidence and proclaim that new data had been found in support? Oh, because everyone and their uncle already knew all about that and it would have been no help? The response of Joseph Smith and others in the Church shows that the early Mormon leaders were anxious to point to evidence in support of Book of Mormon claims. This 1841 book looks like their first big break. The Church then began publishing a series of articles talking about the great support they now had from this important work. Evidence mattered. It was wanted. It was boldly discussed. If Joseph had known of a map that could support the plausibility of Lehi's trail, surely that would have been discussed as soon as possible. No need to suffer criticism and persecution for a decade when a high-end European map could be found somewhere with a treasure like "Nehem" on it. Ditto for books about ancient civilization, temples, etc. If they had been part of Mormon knowledge, they would have been touted. If they had been part of common knowledge, the popular attacks on the Book of Mormon would have been of a much different flavor. As John Clark said, the broad ideas of ancient writing and civilization in the ancient Americas were laughable -- not to everyone, of course, but to the real people that the Saints interacted with and who loudly mocked the Book of Mormon. Some years after giving these lectures I learned that a brief synopsis of Humboldt's works was translated into English and published in London by a lady named Helen Maria Williams, and in seeking among encyclopedias and antiquarian books for proofs I found mention of it on page 265 of Priest's work, 1835 edition, which mention I had not seen before, not having read the book beyond the deluge traditions. But no date was given of its issue, and all search for it proved unavailing. And among all the authors only one or two even mentioned her work. At most it only proved that it was published by or before 1835 (or 1833), while the Book of Mormon was copyrighted in 1829. However, in 1898 Elder Heman C. Smith found a copy of her work in England and brought it to Lamoni, for the Church Library. The date of its publication is not given on its title-page; but on page 33 is given date of 1813 in Paris, which probably means something relating to its issuing in French, for the English issue was from London, whatever may have been the year. After a personal search of twenty-five years in city book-stores for antique works, this is the first copy I have seen. Other elders in the church have likewise searched, but have given no account of this work, which shows how very little it could have been known in America during these seventy years. There is no probability that it was known to Joseph Smith, or to other supposed authors of the Book of Mormon. I dug into the von Humboldt issue in more detail a few years ago and published my findings as "Alexander von Humboldt and the Book of Mormon: What Could Joseph Smith Have Gleaned?" at JeffLindsay.com. The idea that Joseph or his vast team of imagined technical advisors drew upon von Humboldt's works is simply implausible. Everyone and his uncle today knows about ancient civilizations in the Americas. But projecting that situation into an assessment of common knowledge in 1830 results in an over-confident blunder that is belied by the words and actions of early Mormons and their critics, as well as John Lloyd Stephens himself. Yes, some people knew, but in general, what Dr. Clark said is fair. The Book of Mormon came under fire in its first decade or so for its description of literate ancient civilizations in the New World. And like so many other early "problems" with that text, what was once a weakness has become a strength. Despite the increased scholarly interest in ancient Mesoamerica, the works of von Humboldt, Del Rio, Dupaix, and Waldeck had remained relatively unknown to North Americans in the 1820s and 1830s. Berthould's 1822 repackaging of the Del Rio expedition, for example, had failed to find a general audience even in London, while the enormous cost of Humboldt's, King's, Baredere's, and Waldeck's works effectively prohibited their purchase by more than a handful of wealthy European antiquarians. Produced in multi-volume editions with hand-colored lithographs, the works often commanded prices of several hundred dollars per volume--resulting not only in their limited circulation but also in some cases the financial ruin of their publishers. The works of Stephens and Catherwood also provided Latter-day Saints with an effective rebuttal to a common reason for dismissing the Book of Mormon. That book tells of a people who had a sophisticated pre-Columbian culture, were literate, skilled in art (see Helaman 12:2), built temples (see 2 Nephi 5:16; Mosiah 1:18; Alma 16:13; 26:29; 3 Nephi 11:1), palaces (see Mosiah 11:9; Alma 22:2), and many large and populous cities (see Mosiah 27.6; Ether 13:5). This ran counter to one image of native American people that was common in the early nineteenth century. John Lloyd Stephens's biographer notes, "The acceptance of an 'Indian civilization' demanded, to an American living in 1839, an entire reorientation, for him an Indian was one of those barbaric, half-naked tepee-dwellers against whom wars were constantly waged. A rude, subhuman people who hunted with the stealth of animals, they were artisans of buffalo robes, arrowheads, spears, and little else. Nor did one think of calling the other indigenous inhabitants of the continent 'civilized.'" In opposition to this negative but popular view of the of native Americans, some writers, such as Etþan Smith, asserted that American "Indians" were remnants of the lost ten tribes of the house of Israel. Josiah Priest suggested a dazzling variety of transoceanic influences upon historic American Indian culture and history, including "not only Asiatic nations, very soon after the flood, but . . . also, all along the different eras of time, different races of men, as Polynesians, Malays, Australasians, Phoenicians, Egyptians, Greeks, Romans, Israelites, Tartars, Scandinavians, Danes, Norwegians, Welch, and Scotch." Writers differed as to whether American Indian groups were actually descended from civilized migrants or whether cultural remains represented those of an unrelated people which had become extinct, but often drew support for their respective theories from the remains of past ruins which, they argued, evidenced the previous existence of a higher culture and civilization. These writings did not dispel, however, the skepticism of many other Americans who were either unaware of such arguments or found them unpersuasive. All the Mexican constructions, existing at the period of the conquest, have long ago disappeared, with the exception of two or three ruins, which teach us nothing respecting the state of the arts at that period. Two centuries after the Spanish conquest, and perhaps a small part of this period, were found sufficient to sweep away all the works of the original inhabitants of the country. If the temples, and houses, and fortification, and walls of stone, described by the early historians, had corresponded at all to the magnificent accounts given by them, such a destruction would have been impossible. A much longer time would be necessary in any country to cause the disappearance of even wooden structures. The reviewer faulted the historian Clavigero for crediting the descriptions by Cortes and Diaz of great buildings and lofty towers found in the Aztec capital, which the conquistadores said far excelled similar structures in Europe, since "not one stone remains upon another, to testify the existence of one of these palaces, temples, or houses. Two short centuries have swept them away, as completely as the Indian cabins, which during their existence, were reared and occupied upon the Ohio and Mississippi." The learned writer concluded, "It is much easier for us to believe that there is gross exaggeration in these descriptions, than that such constructions were reared by Mexican savages, and that they have all disappeared without leaving a vestige of their existence." Many critics of the Book of Mormon shared this perception and rejected it, at least in part, on the basis of its description of Jaredite and Lehite cultural achievements. Missionary Parley P. Pratt described an 1831 encounter in which an Illinois minister dismissed the Book of Mormon for its apparent lack of archaeological evidence. "He said there were no antiquities in America, no ruined cities, buildings, monuments, inscriptions, mounds, or fortifications, to show the existence of such a people as the Book of Mormon described." "According to [the Book of] Mormon," wrote a British critic in 1839, "these native Americans could read, and write," but "when that country first became known to Europeans, the inhabitants knew no more about letters than a four-legged animal knows the rules of logic; and not a scrap of writing was to be found." There was not, asserted another critic in 1840, "even so much as a shadow or proof, that the sciences of reading and writing [and other evidences of advanced culture mentioned in the Book of Mormon] were ever known here." In later years David Whitmer remembered that the Book of Mormon, when it first came forth, conflicted with contemporary perceptions of native American culture. "When they were first commanded to testify of these things they demurred and told the Lord the people would not believe them for the book concerning which they were to bear record told of a people who were educated and refined, dwelling in large cities; whereas all that was then known of the early inhabitants of this country was the filthy, lazy, degraded and ignorant savages that were roaming over the land." The generally low level of public information and chaotic jumble of "fact" on "pre-Indian" settlers of America that prevailed in Joseph Smith's day is illustrated by Josiah Priest, American Antiquities and Discoveries in the West... (Albany: Hoffman and White, 1833). In this credulous mishmash of opinions and excerpts from many books, mainly about eastern North America, he believes that "not only Asiatic nations, very soon after the flood," but also "Polynesians, Malays, Australasians, Phoenicians, Egyptians, Greeks, Romans, Israelites, Tartars, Scandinavians, Danes, Norwegians, Welch, and Scotch, have colonized different parts of the continent" (p. iv). "All the principles of the stoic school of the Greeks are found in the practice of the American savages" (p. 386). Priest cites Humboldt in curious ways. Page 246 reproduces a drawing of the Aztec calendar stone from him, and he is the cited source for Priest's supposition that Quetzalcoatl, far from being identified with Jesus Christ, was a Buddhist or Brahman missionary from India (p. 206), yet contradictorily, he also thinks that this "white and bearded man" came from some island in the Pacific "on the northeast of Asia" whose inhabitants were more civilized than the Chinese (p. 208). Clavigero is the source for his notion that the Aztecs came from the China coast by sea near the Bering Strait, then on to Mexico (p. 272). Christian symbolism arrived via Asiatic Nestorian Christians who crossed to America in Mongol ships. The ten tribes reached America by ships via Norway, having amalgamated with the Scythians (=Tartars), hence the "Jewish" parallels evident among the Indians. Incidentally, Dr. Samuel L. Mitchell, no doubt the same person who was seen by Martin Harris, is one of the "antiquarians" whose opinions are summarized regarding the origin of the Indians; in Mitchell's view they included Malay, Tartar, and Scandinavian transoceanic voyagers. Also, see a piece in the Portsmouth Journal (New Hampshire) for 1 November 1834, that reported, obviously on the basis of some urban newspaper, the vague information that expeditions into Mexican back country in 1786, 1805, and 1807 had produced drawings and detailed descriptions of ancient monuments; however, these had remained in the portfolios of the Mexican Museum until 1828, when "M. Abbebaradere, a French savant," became possessor of them. He planned to publish them in Paris. The discoveries included "ancient idols of granite,... pyramids, subterranean sepulchres,... colossal bas-reliefs sculptured in granite or modeled in stucco, zodiacs, hieroglyphics differing from those of Egypt," and so on. But no such publication was ever issued, nor was there any equivalent volume until Stephens's. Clavigero's volume on Mexico appeared in an English edition in 1817 in Philadelphia, but it was mainly a description of the Aztecs that gave little ancient historical information. Humboldt's English edition of Vues des cordilleras [Vues des Cordillères et monuments des peuples indigènes de l'Amérique] came out in London in 1814, but neither could it have informed Smith about more than snatches of fact on Mesoamerican civilization. The 1833 volume by Priest, who had vastly better library resources and scholarly skills than Smith, does not cite either Clavigero or Humboldt. For additional discussion on what Joseph Smith could have fabricated based on publications available before 1830, see also Michael Griffith's page, "The Book of Mormon--Ancient Or Modern? Could Joseph Smith Have Written The Nephite Record?" For details on what Joseph could have derived from Alexander von Humboldt, see my new page, "The Book of Mormon and the Writings of Alexander von Humboldt." The issue of written language also merits consideration. The Book of Mormon describes people who kept and cherished written records, who recorded their history, who had priests and prophets and books of scripture and prophecy, and who used written language in their commerce. None of this was characteristic of the Native Americans in Joseph's area. Today we all know that Mesoamericans had written language anciently, but this was not common knowledge in Joseph Smith's day. In fact, it was only in recent decades that this became understood and accepted by most scholars. It is one more area that Joseph could not have fabricated. To propose that ancient Native Americans had culture so advanced as to have a major tradition of written records was utterly without foundation--something likely to be mocked by the world of 1830. But once again, time has vindicated Joseph Smith. Linda Schele, a one-time studio art teacher who made a fateful vacation visit to Mexico that turned her life upside down and helped revolutionize Mayan scholarship, died on Saturday at a hospital near her home in Austin, Texas. She was 55 and widely known for her pioneering work in decoding inscriptions on Mayan monuments. . . .
Dr. Schele (SHE-lee) was more or less contentedly teaching studio art at the University of South Alabama in Mobile when her husband, a Cincinnati-trained architect who had long been fascinated with pre-Columbian architecture, suggested that the couple spend their 1970 Christmas vacation visiting Mayan ruins in Mexico. . . .
As the travelers began their tour, they were persuaded to make a slight detour from their itinerary to spend a couple of hours visiting the ruins at the obscure Mayan city of Palenque. When they got there, Dr. Schele was so taken with the beauty of the site and so enthralled by the scholars she encountered there that the two-hour visit stretched to 12 days. By the time she got back to Mobile she had a new life's work. She remained at South Alabama until she had obtained a doctorate in Latin American studies from the University of Texas and become a professor of art there, in 1981, but Dr. Schele spent virtually every spare moment at Palenque and other Mayan sites. Although the Mayans, who flourished from about A.D. 200 to 900, had long been recognized for their scientific work in devising a calendar based on advanced astronomical observations, they had been largely dismissed by scholars as sort of idiot savants, an illiterate nation of idle and indolent stargazers who devoted all their considerable mathematical and intellectual resources simply to marking time. They were also seen as a blissfully peaceful people, whose fabled cities lacked even rudimentary fortifications. The view had persisted even though a 16th-century Spanish priest had done important, though long-ignored, work suggesting that the glyphs constituted an actual language and though a spate of recent work, derided by established scholars, had even worked out the syntax of the language, in which individual glyphs represented syllables of complex words. Again, let me emphasize that it was only in recent decades that scholars recognized the existence and significance of written records among ancient Native Americans, and systems of writing were only found in Book of Mormon lands, Mesoamerica. Was Joseph Smith just incredibly lucky that what looked like a silly blunder in 1830 would be validated in our day? David Whitmer's statement should be carefully considered, along with the other statements of early Latter-day Saints who faced trouble in defending the Book of Mormon before the arrival of Stephens' publication. Whitmer in an 1883 interview with James H. Hart, said, “When we [the Three Witnesses] were first told to publish our statement, we felt sure that the people would not believe it, for the Book told of a people who were refined and dwelt in large cities; but the Lord told us that He would make it known to the people, and people should discover evidence of the truth of what is written in the Book.” (Interview with James H. Hart, Richmond, Missouri, August 21, 1883; see Lyndon W. Cook, David Whitmer Interviews: A Restoration Witness (Orem, UT: Grandin Book Company, 1991), 76, as cited by Stoddard). These men would have been glad to have some evidence to buttress the plausibility of the book their lives and reputations were tied to. For them, it would take a decade before that relief came. To argue that the idea of advanced ancient civilizations in the Americas was well known to typical Americans does not fit their experience, nor does it fit the witness of Stephens and those who reviewed his work. This was a paradigm shift for the state of common knowledge in the States. In Stephens' own volume 2, he wrote about his previous studies in seeking knowledge about the ancient Americas and describes the lack of widely available information. Beginning on page 295, he reviews the history of exploration at Palenque. When the first official report, after being locked up by Guatemalan authorities for decades, finally was published in London in 1822, "instead of electrifying the public mind, either from want of interest in the subject, distrust, or some other cause, so little notice was taken of it" that an 1831 announcement of another exploration of Palenque in the Literary Gazette in London described that later exploration as if it were a completely new discovery (Stephens, vol. 2, p. 296). He describes other manuscripts as well that were neglected or ignored. So yes, there were people who knew something of the state of Mesoamerica, but this was not common knowledge in any sense of the word, especially in the U.S., until Stephens' work swept the nation and created broad awareness. George Q. Cannon, beginning at age sixteen, worked in the office of the Times and Seasons under the tutelage of John Taylor from April 1843 until early 1846. He would have become intimately familiar with the business of the printing office and the content of what was published and discussed there. In 1853, as a missionary in Hawaii, on reading from Stephens’s Incidents of Travel in Yucatan, he reflected in his journal, “What mighty works the ancients have left in those countries, exciting the wonder and admiration of all travelers and who read the account of their travels. These things are unanswerable arguments in favor of the authenticity of the Book of Mormon.” Writing for the Western Standard in 1857, Cannon explained the significance of Central America in his understanding of Book of Mormon events. Based on what he and his LDS peers experienced, the Book of Mormon had faced plausible criticism based on the "non-existence" of corresponding ruins, according to the common knowledge of the day. The idea that Joseph was drawing upon common knowledge or any less common scholarly works of his day would not become a common anti-Mormon argument until many decades later. Note also that Cannon and other LDS writers felt especially impressed by the location of the ruins, being in a place that seemed to throw exciting new light on the geography of the Book of Mormon, a topic discussed in my post of Feb. 22. Further, don't forget that the most basic aspect of the Book of Mormon was that it was a record engraved upon metal plates from an ancient people who brought sacred writings on metal plates with them from the Old World. Stephens strengthened the case for some kind of ancient writing in the Americas, but even with that, the concept of writing on metal plates was ridiculed for decades to follow. No such records were ever engraved upon plates of gold or other metals. He doesn't seem to be hinting that the basic idea of records on metal plates was well known and plausible, albeit a pious fraud in Joseph's case. No, the very concept of such props is absolutely rejected -- almost as if it were too funny for words. Stuart Martin, writing in 1920, says that no one pointed out to young Joseph that gold would corrode if left buried so long, ridiculing the concept of preserving a text on buried gold plates. (Mystery of Mormonism, printed by Kessinger Publishing, 2003, p. 27). Bad metallurgy, Mr. Martin. All the writings of the Jews long anterior and subsequent to Zedekiah were in rolls. (Isa., xxxiv. 4; Jer. xxxvi. 25; Ezek., iii 9, 10l Ps. xl. 7; Zech. v. 1, etc., etc.) These rolls were chiefly parchment and papyrus. . . . The use of this material superseded the stones filled with lead (Job), Hesiods leaden tables, Solon's wooden planks, the wax tables, so clumsy and easily erased. This material rolled up could be bound with flax and sealed. . . . The Jews used this material. The Egyptians, whose language Nephi gives his father, used this material. Contradiction and inconsistency are stamped on any other assertion. This is another strong proof of imposture. In spite of the documentation I provided above on this post about the long struggle it took for Mayan hieroglyphs to be recognized as written language that could be used to convey written history, critics seem to think that written language among the ancients must have been well known because a few old but not widely known sources refer to "hieroglyphics" in Central America. But in addition to the lack of common knowledge about ancient hieroglyphics in Central America, whether those hieroglyphics were actually a written language that could convey history was frequently disputed even into the 20th century. Indeed, the leading and highly influential expert on the Mayans in the 1950s, J. Eric S. Thompson, strongly resisted the possibility of those hieroglyphs being part of a written language and argued that they were "sublime" and "anagogical" expressions of cosmic numerology and time keeping, not written history. See Byron Ellsworth Hamann, "How Maya Hieroglyphs Got Their Name: Egypt, Mexico, and China in Western Grammatology since the Fifteenth Century," Proceedings of the American Philosophical Society, vol. 152, no. 1 (Mar., 2008), pp. 1-68; see particularly page 4. Another useful reference on the topic of Book of Mormon claims regarding ancient written records is The Book of Mormon and Other Hidden Books Out of Darkness Unto Light by John A. Tvedtnes (Provo, Utah: FARMS, 2000). LDS defenders sometime grow impatient, even flabbergasted, with critics who refuse to acknowledge the existence of any evidence for the Book of Mormon, in spite of what some of us feel are impressive leads that should at least raise an eyebrow or two. It's a mistake for us to assume that our critics are deliberately being blind or dishonest. We need to remember that faith is required not just to accept Christ, the Restoration, and the divinity of the scriptures, but a touch of faith also required to even begin to recognize the value of evidence. If one is confident that one already has all the answers, it is impossible to ask the questions that can lead to new and surprising answers. If one is confident that disease is due to bad "humors" or vapors just as Aristotle said, then someone presenting "evidence" that limes prevent or cure scurvy cannot be taken seriously and the "evidence" will never get past the scare-quotes treatment from those who roll their eyes at the preposterous claims of some upstart. This is why it took the elite minds over the Royal Navy of Britain over 200 years and thousands of lost lives of British sailors to finally acknowledge the evidence that scurvy was easily prevented with a better diet. Without the faith to accept that maybe there is more to the story than we already know, without the open-mindedness to entertain a radical new proposal seriously to fairly consider another point of view, then there is simply "no evidence" to be considered, no matter how much a passionate advocate of something else rambles on about his so-called "evidence." This is why Ignaz Semmelweis faced massive opposition and ridicule in spite of solid evidence that some invisible factor could be passed on from corpses to mothers giving birth and give them fatal fevers. That invisible factor, known today as germs, did not fit the rigid mental framework of the elites in charge of peer review for the medical profession, and thus Semmelweis's passionate battle for truth faced decades of passionate opposition. His "evidence" just wasn't there, as far as the elite cared, for the lacked the particle of faith required to imagine that there could be something to the invisible particles Semmelweis claimed were there. We like to think that those who resisted progress regarding scurvy or germ theory were stupid and petty, but they were actually well educated elites just doing their job -- but with a lack of faith in other possibilities. They were too secure in the received wisdom they already had and could not see more, no matter how painfully obvious it seems today. We LDS folks get frustrated at the results, but we should be more compassionate. Here on this blog, one of our most vocal critics has resisted every piece of evidence related to Book of Mormon plausibility, including some works from non-LDS scholars and some items that have gone through non-LDS peer review, and still claims that we have nothing, not one scrap, not one non-LDS source in our favor, not one piece of peer-reviewed data. This same critic was once asked what could possibly count as actual evidence in his view, and he responded that it would be nice, for starters, to see evidence of a Mayan glyph that meant "and it came to pass." A link was promptly provided to exactly that--one of the interesting tiny little bits of evidence from the Mesoamerican venue--and instead of saying, "Wow, well, that was at least a little interesting," it was just another dismissal and then moving on to other charges. When the evidence he asked for was provided, it was obviously not relevant. Just didn't count. It's not because he's dishonest or blind or mean. He's intelligent and sometimes quite interesting. But lacking faith that there could be a real Moroni and real golden plates, any "evidence" for such can't possibly be evidence. I've seen exactly the same in dealing with some critics attacks on the Arabian evidence. Bountiful, for all practical purposes, just isn't there. How could such a place be uninhabited as the Book of Mormon implies? Preposterous. Must not be there, per an ivy-league educated elite with access to much better maps than Joseph Smith ever dreamed of. And yet it is. Faith is required to recognize evidence as evidence. It's no use getting exasperated with critics. Be patient and don't waste too much breath. For some who are open to other possibilities, the evidence can make a difference, and it's for them that we can keep sharing and pointing to new things we learn or discover that might be helpful. But don't expect to win over critics or get any admissions from them by hammering them over the head with Nahom, chiasmus, Margaret Barker's findings, evidences of writing on metal plates, Janus parallelisms, or whatever. That evidence just isn't there without a particle of faith. As for disease and especially scurvy, our modern, scientific, peer-reviewed society has progressed to the point where we all know citrus fruit prevents scurvy, and where you can also go to jail for printing "helps cure scurvy" on your package of orange juice. The problem is that the elites are still in charge and they have very demanding standards for anyone wishing to claim "evidence" for health food's "curative" effects, so be careful. After 187 years of critics poking fun at the Book of Mormon and exposing its weaknesses, today it seems to be the established view of numerous highly educated elites that there is "not a scrap of evidence" supporting the Book of Mormon. That is the consensus, at least, among those who are rather unfamiliar with the text and the associated evidence related to Book of Mormon claims. But for those who are willing to look a little deeper, a much different world emerges. The non-existent scraps of evidence are forming a hefty pile that demands a little attention. No, we are not able to prove that angels exist and Jesus visited the Americas based on undeniable evidence. We don't even have the original gold plates for scientific analysis. Faith is still an essential and merciful ingredient, as intended by the Lord, for accepting the Book of Mormon as the word of God and as a testament of Jesus Christ. For those not interested in faith, there are plenty of reasons one can pick for ignoring Christ, the scriptures, and especially Mormonism. But for those with a particle of faith, there are also many notable particles of intellectually satisfying evidences that can strengthen faith or help overcome challenges to faith. 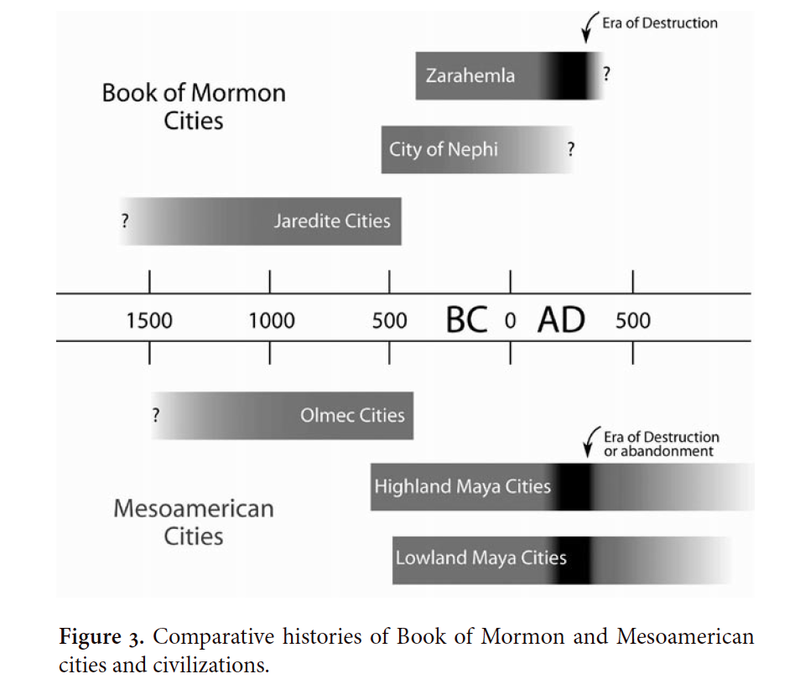 So let's look at the big picture of where we are in terms of Book of Mormon evidence. The testable claims from the Book of Mormon began with the declaration that a sacred record had been preserved on metal plates and buried in a stone box by people from an ancient literate civilization with Old World roots. That story featured numerous hilarious concepts when it was presented. Today, we know that stone boxes were used by ancient Native Americans to preserve sacred objects, especially in Mesoamerica, where most LDS scholars believe is the only plausible location for the New World Book of Mormon events. You can see multiple examples of sacred stone boxes in the National Archaeological Museum in Mexico City, as I have reported here earlier. We know that writing sacred record on metal plates was a known practice in the ancient Middle East, making the existence of the brass and gold plates less hilarious today than it was in 1830. We know that there were advanced writing systems in ancient Mesoamerica. Things that were laughable among the general public and unknown or not well known in 1830 have become more established today. That's just a beginning of numerous issues where once ridiculous Book of Mormon claims now have at least some evidence in their support. And as for the possibility of Joseph's gold plates actually existing, we now have detailed scholarship on the statements and activities of numerous witnesses providing a compelling case that the gold plates were real. Laughable details such as the impossibility of Joseph carrying a 200-pound block of gold have become more plausible in light of analysis regarding what real hand-made metal plates would actually weigh, especially if made from the Mesoamerican gold-copper alloy known as tumbaga. A figure of 60 pounds, consistent with estimates from witnesses, is entirely reasonable. The whole idea of metal plates is less laughable than it was initially, and not only because examples of writing on metal plates in the Old World have been found. Many other issues of this kind could be mentioned, such as Book of Mormon claims of ancient temples, ancient highways, practices of warfare, and, say, the idea of an older civilization that gave way to a newer civilization with dates that could correspond with the Olmecs and the later groups in Mesoamerica such as the Mayans. The correspondences are not just the big picture stuff, but get down into many interesting details such as the hundreds of correspondences from many disciplines examines by John Sorenson in Mormon's Codex and the linkages to Mesoamerica examined by Brant Gardner in Traditions of the Fathers. While there have been many exciting finds and remarkable publications in the past decade, including the two books I just mentioned, there is still a great deal of value in a 2005 presentation given by Mesoamerican archaeologist John Clark about the state of evidence relating to the Book of Mormon. If that presentation were redone today, one might wish to add many details regarding the Arabian Peninsula evidence, new linguistic evidence both relating to the miraculous translation of the Book of Mormon and the presence of significant Old World influence in Uto-Aztercan languages, and abundant evidence of Semitic word plays in the Book of Mormon that point to ancient origins, but the 2005 summary of John Clark is still highly informative. The presentation, "Debating the Foundations of Mormonism: The Book of Mormon and Archaeology" by John E. Clark, Wade Ardern, and Matthew Roper, was made at the August 2005 FAIRMormon Conference. The transcript is available at FAIRMormon.org. The video is jsut a 7-minute segment that begins a couple minutes into John's presentation (skipping his hat tip to the Tanners for their helpful anti-Mormon work, which John feels has actually helped strengthen the case for the Book of Mormon). You can also see the full nearly-hour-long video on Youtube. In the past fifty years, friends and foes have adopted Joseph's plan of comparing ruined cities with those in the Book of Mormon. Both sides believe archaeology is on their side. Consider the argument against the Book of Mormon circulated recently by an evangelical group. "The Bible is supported in its truth claims by the corroborating evidence of geography and archaeology. That assertion cannot be said for the Book of Mormon. Several decades of archaeological research funded by LDS institutions concentrating in Central America and Mexico have yielded nothing that corroborates the historical events described in the Book of Mormon." The only things wrong with this clever argument are that its claims are false and its logic faulty. Archaeology and geography support the Book of Mormon to the same degree and for the same reasons that they support the Bible. Both books present the same challenges for empirical confirmation and both are in good shape. Many things have been verified for each but many have not. Anti-Mormon arguments specialize in listing things mentioned in the Book of Mormon that archaeology has not found. Rather than cry over missing evidence, I will tell you about evidence that has been found. The pamphlet lists eight deficiencies. First, that no Book of Mormon cities have been located, and last, that no artifact of any kind that demonstrates the Book of Mormon is true has been found. This last assertion is overly optimistic in suggesting that such material proof is even possible. No artifact imaginable, or even a roomful, could ever convince critics that the Book of Mormon is true. The implied claim that the right relic could prove the book's truth beyond all doubt is too strong and underestimates human cussedness. Moroni could appear before Congress tomorrow with the golden plates, the Sword of Laban, and the Liahona in hand, and this would not satisfy public demands for more proofs. The logical challenges with the first assertion, that no cities have been located, are more subtle. Book of Mormon cities have been found, they are well known, and their artifacts grace the finest museums. They are merely masked by archaeological labels such as "Maya," "Olmec," and so on. The problem, then, is not that Book of Mormon artifacts have not been found, only that they have not been recognized for what they are. Again, if you stumbled onto Zarahemla, how would you know? One last point about significant evidence. The hypothesis of human authorship demands that truth claims in the Book of Mormon be judged by what was believed, known, or knowable in Joseph's backyard in the 1820s. The book's description of ancient peoples differs greatly from the notions of rude savages held by nineteenth-century Americans. The book's claim of city-societies was laughable at the time, but no one is laughing now. As the city example shows, the lower the probability that Joseph Smith could have guessed a future fact, the stronger the likelihood that he received the information from a divine source. Consequently, the most compelling evidence of authenticity is that which verifies unguessable things recorded in the Book of Mormon, the more outlandish, the better. Confirmation of such things would eliminate any residual probability of human authorship and go a long way in demonstrating that Joseph Smith could not have written the book. This is precisely what a century of archaeology has done. I will consider a few items in the time remaining. The one requirement for making comparisons between archaeology and the Book of Mormon is to be in the right place. For reasons I will explore in a few minutes, Mesoamerica is the right place. The first archaeological claims related to the Book of Mormon concern the facts of September 22, 1827, the actuality of metal plates preserved in a stone box. This used to be considered a monstrous tale, but concealing metal records in stone boxes is now a documented Old World practice. Stone offering boxes have also been discovered in Mesoamerica, but so far the golden plates are still at large, as we would expect them to be. Another fact obvious that September morning was that ancient peoples of the Americas knew how to write, a ludicrous claim for anyone to make in 1827. We now know of at least six Mesoamerican writing systems that predate the Christian era. This should count for something, but it is not enough for dedicated skeptics. They demand to see reformed Egyptian, preferably on gold pages, and to find traces of the Hebrew language. There are promising leads on both, but nothing conclusive yet. New scripts are still being discovered, and many texts remain undeciphered. The example shown here was recovered 56 years ago and qualifies as America's earliest writing sample, but so far nothing much has been made of it and most scholars have forgotten that it exists. The golden plates and other relics ended up in New York in the final instance because the Nephites were exterminated in a cataclysmic battle. The Book of Mormon brims with warfare and nasty people. Until twenty years ago, the book's claims on this matter were pooh-poohed by the famous scholars. Now that Maya writing is being read, warfare appears to have been a Mesoamerican pastime. The information on warfare in the Book of Mormon is particularly rich and provides ample opportunity to check Joseph Smith's luck in getting the details right. The warfare described in the book differs from what Joseph could have known or imagined. In the book, one reads of fortified cities with ditches, walls, and palisades. Mesoamerican cities dated to Nephite times have been found with all these features. The Book of Mormon mentions bows and arrows, swords, slings, scimitars, clubs, spears, shields, breastplates, helmets, and cotton armor--all items documented from Mesoamerica. Aztec swords were of wood, sometimes edged with stone knives. There are indications of wooden swords in the Book of Mormon. How else could swords become stained with blood? Wooden swords could sever heads and limbs and were lethal. The practice of taking detached arms as battle trophies, as in the story of Ammon, is also documented from Mesoamerica. Another precise correspondence is the practice of fleeing to the summits of pyramids as places of last defense and consequently, of eventual surrender. Conquered cities were depicted in Mesoamerica by symbols for broken towers or burning pyramids. Mormon records this practice. Other practices of his day were human sacrifice and cannibalism, vile behaviors well-attested for Mesoamerica. The final battle at Cumorah involved staggering numbers of troops and of Nephite battle units of 10,000. Aztec documents described armies of over 200,000 warriors, also divided into command units of 10,000. The Aztec ciphers appear to be propagandistic exaggeration. I do not know whether this applies to Book of Mormon numbers or not. In summary, the practices and instruments of war described in the Book of Mormon display multiple and precise correspondences with Mesoamerican practices and in ways unimaginable to nineteenth-century Americans. Mesoamerica is a land of decomposing cities with their pyramids or towers, temples, and palaces--all items mentioned in the Book of Mormon but foreign to the gossip along the Erie Canal in Joseph Smith's day. Cities show up in all the right places and for the predicted times. One of the more unusual and specific claims in the Book of Mormon is that houses and cities of cement were built by 49 B.C. in the land northward, a claim considered ridiculous in 1830. As it turns out, it receives remarkable confirmation at Teotihuacan, the largest pre-Columbian city ever built in the Americas. Teotihuacan is still covered with ancient cement that has lasted over 1500 years. All Book of Mormon peoples had kings who ruled cities and territories. American prejudices of native tribes in Joseph's day had no room for kings or their tyrannies. These were crazy claims. The last Jaredite king, Coriantumr, carved his history on a stone about 300 B.C., an event in line with Mesoamerican practices at that time. A particular gem in the book is that King Benjamin labored with his own hands, an outrageous thing for Joseph Smith to claim for a king. It was not until the 1960s that anthropology caught up to the idea of working kings and validated it among world cultures. Even more specific, consider Riplakish, the tenth Jaredite king, an oppressive tyrant who forced slaves to construct buildings and produce fancy goods. Among the items he commissioned about 1200 B.C. was an exceedingly beautiful throne. The earliest civilization in Mesoamerica is known for its elaborate stone thrones. How did Joseph Smith get this detail right? Not all evidence concerns material goods. A striking correspondence is this drawing from the Dresden Codex, one of four surviving pre-Columbian Maya books. It shows a sacrificial victim with a tree growing from his heart, a literal portrayal of the metaphor preached in Alma chapter 32. Other images depict the Tree of Life. The book's metaphors make sense in the Mesoamerican world. We are just beginning to study these metaphors, so check in with the Journal of Book of Mormon Studies for future developments. A correspondence that has always impressed me involves prophecies in 400-year blocks. The Maya were obsessed with time, and they carved precise dates on their stone monuments that began with a count of 400 years, an interval called a bactun. Each bactun was made up of twenty katuns, an extremely important twenty-year interval. If you will permit me some liberties with the text, Samuel the Lamanite warned the Nephites that one bactun shall not pass away before they would be smitten. Nephi and Alma uttered the same bactun prophecy, and Moroni recorded its fulfillment. Moroni bids us farewell just after the first katun of this final bactun, or 420 years since the sign was given of the coming of Christ. What are the chances of Joseph Smith guessing correctly the vigesimal system of timekeeping and prophesying among the Maya. The list of unusual items corresponding to Book of Mormon claims could be extended. The LDS tendency to get absorbed in specifics has been characterized as a method for distracting attention from large problems by engaging critics with endless irrelevant details, much as a mosquito swarm distracts from the rhinoceros in the kitchen. Let's take up the dare to consider big issues, namely geography and cycles of civilization and population. As is clear from the Cluff expedition, if the geography is not right, one can waste years searching for Zarahemla and never get there. Book of Mormon geography presents a serious challenge because the only city location known with certitude is Old World Jerusalem, and this does not help us with locations in the promised land. However, it is marvelous for the Old World portion of the narrative. As Kent Brown and others have shown, the geography of the Arabian peninsula described in First Nephi is precise down to its place names. The remarkable geographic fit includes numerous details unknown in Joseph Smith's day. For the New World, dealing with geography is a two-step exercise. An internal geography must first be deduced from clues in the book, and this deduction must then become the standard for identifying a real world setting. John Sorenson has done the best work on this matter, and this is his internal map of physical features and cities. The Book of Mormon account is remarkably consistent throughout. Nephite lands included a narrow neck between two seas and lands northward and southward of this neck. The land southward could be traversed on foot with children and animals in tow in about thirty days, so it could not have been much longer than 300 miles. The 3000 miles required for the traditional geography is off by one order of magnitude. Nephite lands were small and did not include all of the Americas or their peoples. The principal corollary of a limited geography is that Book of Mormon peoples were not alone on the continent. Therefore, to check for correspondences we must find the right place and peoples. It is worth noticing that anti-Mormons lament the demise of traditional, continental geography because it was so easy to ridicule. The limited geography is giving them fits. . . .